One of my favourite things about cooking a large ham dinner is all of the leftovers. I think that I look forward to the leftover even more than the initial dinner and I always have fun trying new dishes using the ham. I recently came across the this recipe for a ham and leek tart on Picante Cooking and I immediately knew what I would be doing with some of the leftover ham in my freezer. This ham and leek tart is pretty simple and dead easy to make! It starts out with an all butter pie crust which you can easily make yourself or you could save some time by using a store bought one. Next up the ham and leeks are sauted, and mixed up with an egg, some cream, cheese and a touch of grainy mustard. After just 20 minutes in the oven the cheese is all melted and bubbling and golden brown and good. The ham and leek tart is amazingly tasty and all of the flavours work well together. I have to say that my tart disappeared way too quickly. 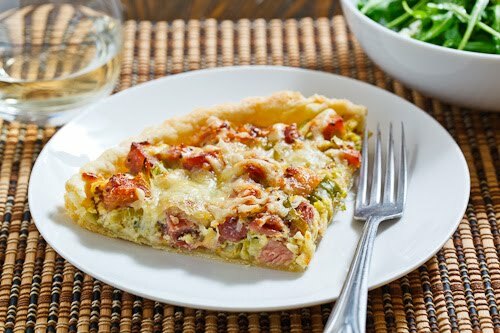 🙂 I served the ham and leek tart with a simple arugula salad along with a glass of white wine. Roll the pie dough out, fit it into the tart pan and trim the edges. Heat the oil in a pan over medium. Add the ham and saute until it starts to turn lightly golden brown, about 7-10 minutes and set aside. Melt the butter in the same pan over medium heat. Add the leeks and saute until tender, about 7-10 minutes. Add the garlic and saute until fragrant, about a minute and remove from heat. Mix the egg, cream and mustard. 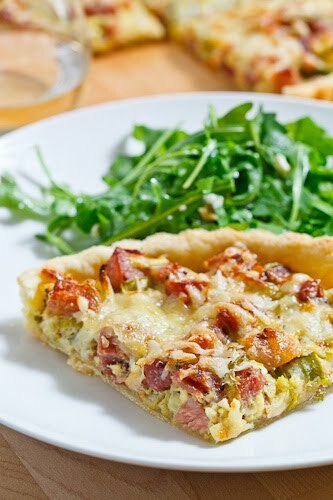 Mix the ham, leeks, the egg mixture and 1 cup of the cheese and pour it into the tart shell. Bake in a preheated 350F/180C oven until the cheese has melted an the pie shell is a light golden brown, about 20 minutes. What a simple and beautiful recipe. I'm very tempted to try this for brunch next weekend. This looks heavenly Kevin! Now I want a ham dinner and this tart! This tart looks wonderful, Kevin! I love the flavors you used. I've never made a savory tart before, but there's no time like now to try! Thanks for sharing this recipe and your beautiful photography. I like savory tart and this looks delicious. There hasn't been a single tart you've featured on this blog that I haven't wanted. This looks so good! I love the flavor of leeks. That tart must be delicious! The salty ham paired with the almost sweet and buttery leeks must make for a great tart! Kevin, I always enjoy your recipes. This one looks fantastic and happened to arrive at just the right time. I'm sitting here looking at two big, beautiful leeks and baked a ham last night! I'd say thsi takes leftovers to a whole new level Kevin. I love how you've managed to keep it looking fresh. So many tarts end up looking a week old when they are inappropriately baked, but yours looks just wonderful! That top photo is absolutely sublime! Makes me want to go and cook a ham right now so I can make this. Looks are always a favorite. They just scream soft oniony flavor without being overwhelming. Delicious tart. I'm in full agreement! I definitely feel that way when I'm cooking any big meat be it a ham, roast or chicken. I love that using up whatever remains usually taps into my creativity. Love ham and leeks together. They're such a great pairing, especially when there's cream and cheese and butter involved. Sounds like the perfect main dish for my next brunch! I make a hand pie that is similar to this and it is so tasty!! Your tart is beautiful! 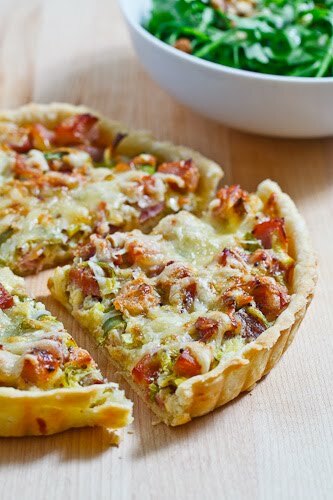 Kevin, the ham and leek tart looks great, and I'll give it a try this weekend when I have family visiting. I wanted to ask a question not related to this specific recipe, however. My daughter bought a chocolate peanut butter variety of the Nanaimo bar at a bake sale. She said it had the chocolate/nut base with the coconut, but the cream middle layer, while having the texture and underlying taste of the traditional filling, there was a peanut butter flavor that was fantastic, and she wanted me to try and whip up a batch. I've looked for recipes online, without much luck. Would you have any tips on how to add peanut butter, or whatever else might lend a peanut buttery flavor to the cream filling in your recipe? the tart looks amazing. but the reason I want to leave a comment is to thank you for your post on Food Bloggers Unite re adding "print this" to your recipes. I just followed the step and it was so simple!! now to add it to my other 600+ posts. Oy. Great combination of flavors and an easy way to use up leftover ham. Always enjoy your recipes and your photos are beautiful. My French friend often makes a Potato and Leek soup, it's quite common in France (according to her)but now I feel compelled to share your recipe with her. Now this looks seriously GOOD! I'm definitely with you on the cooking hams and looking forward to the leftovers. I often choose my hams based on how I think the butcher will slice it (or how I will need to cut it later), so I know how it'll work in a big pot of ham and beans, hehe. I could eat this for breakfast, lunch, and dinner! Fantastic! The whole family loved it, even my picky eaters. Just by looking at the photograph, I thought this was a thin crust pizza. I never thought of using pie crust for pizza. I think it would work just fine!